One of my favorite English-style beers on the market is Fuller’s London Porter. Smooth, rich, and chocolate-ity, it’s also one of the only commercial beers I have ever tried to clone. Here is my attempt to clone this fantastic beer, and hope my fellow bloggers can learn from this first iteration. In part 1, I discuss my recipe design, chiefly, the use of brown malt. In part 2, linked here, I review both of these tasty beers. If you have successfully cloned this beer, please let us know in the comment section below and how it went! Cheers, and happy brewing! My starting point was Fuller’s website, where I learned that brown malt is the secret ingredient which makes this beer so special. New to brewing? Brown malt is a very historical malt, and made the basis of historical porters and stouts in the 18th and 19th century’s before the existence of crystal and roasted malts. On the Lovibond range from 50-75 L, brown malt will lend a roasted, slightly nutty flavor with some bitterness. Unlike hop bitterness, brown malt bitterness is more on the dark chocolate spectrum, like baker’s chocolate. Want to know more about brown malt and how it’s made? Check out this reference by Kristen England at BYO. With this lead, I searched the web for previous London Porter clones using brown malt. There were a few hits. Interestingly, Kristen England gives his take on the London Porter clone at the end of brown malt article from BYO here. 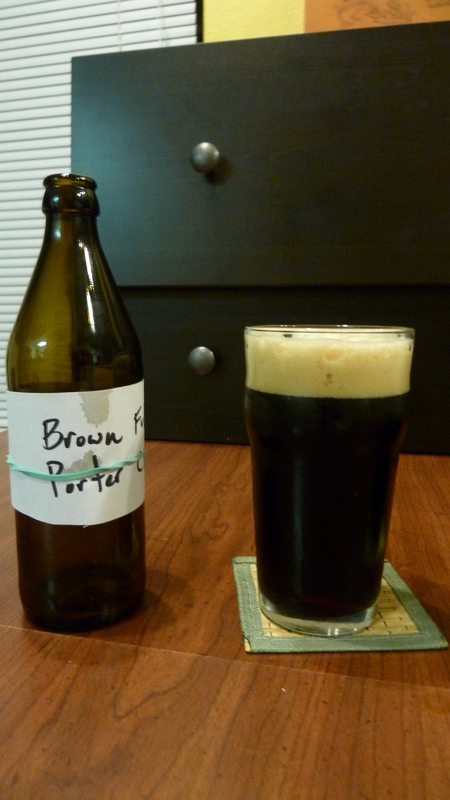 A small batch London Porter clone was found at the Perfect Pint blog with a promising review. Another clone recipe was found at the Fermentology blog with similar results. From these three recipes, a London Porter clone seems to have four essential malt elements: Maris Otter base malt (~70-80%), brown malt (~5-15%), dark crystal (~5-10%), and chocolate malt(~5-10%). Additionally, since this is a Fuller’s beer, the Fuller’s yeast strain must be used. Many yeast manufacturers produce the Fuller’s strain (Wyeast 1968, White Labs 002, S-04). Therefore, with the basic London Porter architecture in place, I generated the following recipe as my clone attempt number one. For tasting notes of the London Porter clone recipe above compared to the real thing, Part 2 is linked here. Cheers! Fuggles at 60 and 15 minute to get to 20 IBUs. I never really used brown malt, but I think I might have to use it now, sounds like it can have a lot of use. It’s fun to play around with malt, especially in small batches. I’m (eventually) planning a small brown porter recipe with about 20 percent brown malt, sort of taking it to the next level of intensity. Thanks for reading! Cheers! Nice post especially the links on brown malt. My base red ale originally called for brown malt. However, I’ve had to go with crystal since I’ve had a difficult time finding brown. I’ll have to go out and get some London Pride.